The hottest thing in the Android world now is the long awaited Samsung Galaxy S4 and as the initial launch date of Samsung’s new flagship smartphone gets closer we learn more about what the Galaxy S4 will offer us. The latest news is a bit more information on the new Samsung Knox feature that will come on all new Galaxy S4’s; which Samsung is also calling the new and improved security features ‘SE Android’ or Security Enhanced Android. 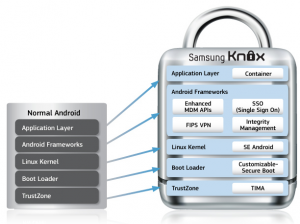 Samsung Knox is primarily made for businesses, government agencies, and others to be able to better lock down and manage their Android devices; this being the first time a smartphone has ever shipped with embedded software that track, remotely wipe, and possibly recover a device. Similar to a laptop LoJack, Samsung Knox could possibly give a user or an organization the ability to track, recover, wipe, or lock a device just about anywhere in the world. But wait, there’s more; if a device with Samsung Knox on it is somehow stolen and wiped by a thief the program itself will pull automatically reinstall from the device’s firmware. This feature will still allow a device with Samsung Knox to be tracked even after a complete wipe. Not to worry though, your Galaxy S4 isn’t going to be tracking everywhere you go the second you boot up for the first time, the tracking from Samsung Knox won’t work unless you turn it on. This done to preserve the privacy of both the smartphone owner and the data on the smartphone. 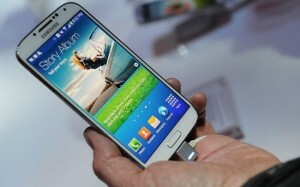 The features of Samsung Knox will likely become a part of mobile carrier’s service plan in the future. Many consumers are happy with having a product like Samsung Knox on their devices, giving them much more control and security over their Android smartphones.